As per Rc No 152, All the District Educational Officers in the state are informed that the Government of Andhra Pradesh is taking up several IT initiatives in the state to strengthen the School Education System. Among major initiatives taken up by the Department, E-Hazar is one of the prestigious project taken up by the department. For effective functioning of E Hazar leave management system through APTeLS an App is introduced. 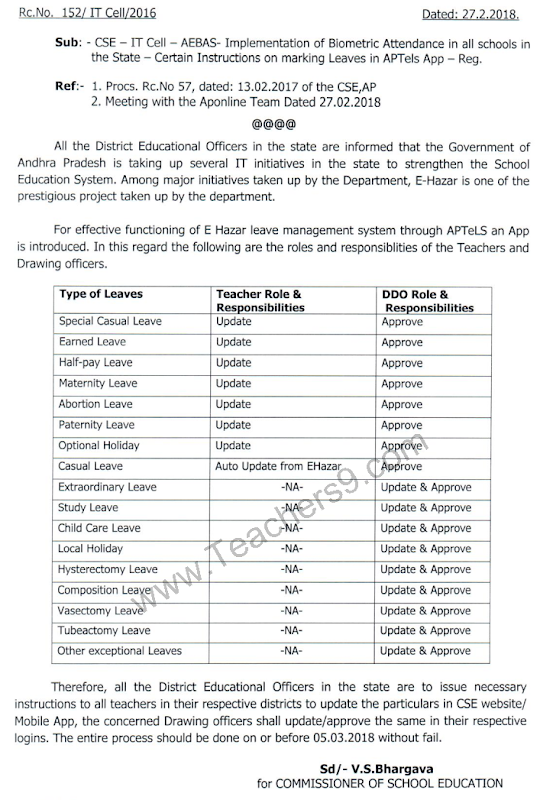 In this regard the following are the roles and responsibilities of the Teachers and Drawing officers. Therefore, all the District Educational Officers in the state are to issue necessary instructions to all teachers in their respective districts to update the particulars in CSE website/Mobile App, the concerned Drawing officers shall update/approve the same in their respective logins.